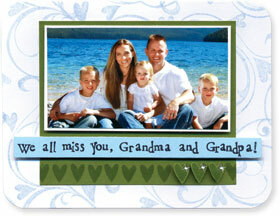 Include a family photo on a special card. On a White Notecard, stamp the Heaert Flourish image with soft blue ink repeatedly. Mat the photo on a White notecard and trim. Create another mat with green cardstock, leaving extra room at the bottom. On a blue cardstock strip, stamp the message using letters from the Printer’s Type Alphabets in black ink. Add to the card with pop dots. With green ink, stamp heart image from the So Sweet set along the bottom of the green. On additional green cardstock, stamp three more green hearts. Cut out and attach with pop dots as shown. Instead of stamping heart accents, try using Hero Arts Card Buttons as an embellishment. To avoid mistakes, try alphabet stamping on a cardstock strip and adhering to the card instead of stamping directly onto the card.